This country farmhouse charms with its wrapping front porch and gabled dormers. The foyer gives way to a generous great room with fireplace, cathedral ceiling, and balcony above. 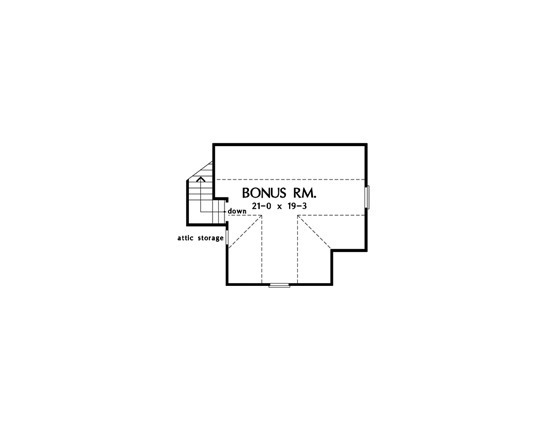 Nearby, a flexible bedroom/study has a walk-in closet and adjacent full bath. The first-floor master suite with sunny bay window features a private bath with cathedral ceiling, his and her vanities, and a separate tub and shower. 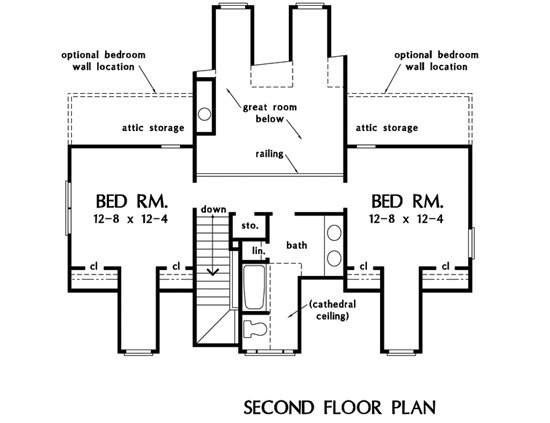 Two more bedrooms, each with dormer windows, are located upstairs and share a bath with cathedral ceiling, palladian window, and double bowl vanity. 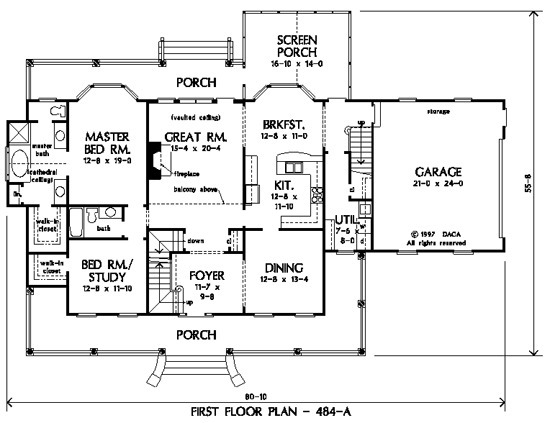 A bonus room over the garage completes the plan. Porch - Screened: 251 Sq. 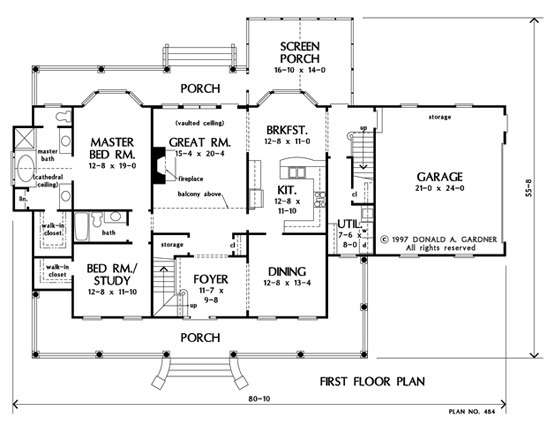 Ft.
House Dimensions: 80' 10" x 55' 8"
Great Room: 15' 4" x 20' 4"
Foyer (Flat): 11' 7" x 9' 8" x 9' 0"
Dining Room (Flat): 12' 8" x 13' 4" x 9' 0"
Great Room (Vaulted): 15' 4" x 20' 4" x 19' 0"
Kitchen (Flat): 12' 8" x 11' 10" x 9' 0"
Breakfast Room (Flat): 12' 8" x 11' 0" x 9' 0"
Utility Room (Flat): 7' 6" x 8' 0" x 9' 0"
Bonus Room (Clipped): 21' 0" x 19' 3" x 9' 0"
Master Bedroom (Flat): 12' 8" x 19' 0" x 9' 0"
Bedroom / Study (Flat): 12' 8" x 11' 10" x 9' 0"
Bedroom #2 (Flat): 12' 8" x 12' 4" x 9' 0"
Bedroom #3 (Flat): 12' 8" x 12' 4" x 9' 0"
Porch - Front (Flat): 55' 0" x 6' 6" x 0' 0"
Porch - Rear (Flat): 35' 2" x 6' 6" x 0' 0"
Porch - Left (Flat): 11' 0" x 6' 6" x 0' 0"
Porch - Right (Flat): 16' 10" x 6' 6" x 0' 0"
Porch - Screen (Vaulted): 16' 10" x 14' 0" x 0' 0"
Balcony (Flat): 15' 4" x 4' 0" x 9' 0"
Storage (1st Fl.) (Clipped): 5' 8" x 3' 4" x 0' 0"